Sha'ab Abu Nuhas is a large triangular shaped reef quite a long way from Hurghada and El Gouna but possible in a daytrip. Shaab Abu Nuhas means father of brass and got this name because of all the brass that originally went down with the shipwrecks. Nowadays, no brass can be found any more. Local fishermen freedived down and collected and sold all the brass that ever was there, making a fortune with it. 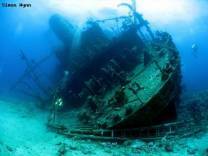 Take a live-aboard trip if you want to have time to see all of the main four wrecks. The reef is located just a little bit north of Shadwan Island and the area is covered with shipwrecks. The rough north side can make moorings impossible and the big unpredictable currents have been known to dislocate divers. Some divers have even been stuck in between of currents. The wrecks are obviously at the north and rougher side of the reef with the main ones from west to east being the Giannis D, the Carnatic, the Chrisoula K and the Kimon M. Most of them didn't sink before 1970 except for the Carnatic, which is a very old ship in beautiful conditions and sunk in 1869. Going here is obviously for the wrecks, but marine life fanatics will see fish and pelagic as well.